In this Collected Editions co-review, contributor Doug Glassman ('80s Marvel Rocks!) 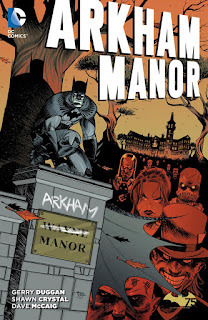 and I discuss Arkham Manor, with spoilers. Collected Editions: I've never read any stories of Marvel's Deadpool, and that's due in part to my sense that Deadpool is kind of a Lobo-type figure, ultra-violent and irreverent, and so were I to venture to "the other side," that's not where I'd start. To that end, what gave me the most pause in picking up Arkham Manor was Deadpool writer Gerry Duggan. Would this odd Arkham Manor quasi-miniseries be an immediately-forgettable Batman Eternal tie-in, or worse some sort of gross-out lampooning of the Batman character? Instead, Duggan and artist Shawn Crystal's story emerges as a surprisingly sensitive examination of Batman, his use of violence, and the villains he fights on a nightly basis. There is blood, to be sure, and disturbing imagery, but Arkham Manor actually ends rather heartwarmingly. Duggan populates Arkham with both "normal" (violent, creepy) inmates and then with Batman's foes mostly out of costume, giving the book a more realistic tone; I'd have been happy to keep reading this "street level" view of the famous asylum had this series continued. I think you can see some of that approach in relation to Batman in Arkham Manor: Duggan is writing a Batman with a frayed mind, a Batman whose grand strategy is pulling a Matches Malone and checking himself into the insane asylum that used to be his house. If anything, Arkham Manor strengthens my trust in Duggan as a writer, which is good since he has about half a dozen titles to his name in the All-New, All-Different Marvel relaunch. CE: I don't think any of us believed that Wayne Manor would become Arkham Asylum long-term or that Batman would perpetually live below or within Arkham (hence the collective "Are you sure this isn't a miniseries?" when the book was announced), but Arkham Manor is a wonderfully in-continuity "what if," as it were. You mentioned the abject bizarreness (taken as rote) of Batman just checking himself into Arkham; I further liked this idea that Batman's got his own prison (now prison-within-a-prison) down in the Batcave, where he's keeping Hush. It kind of reminded me of those old Super Powers playsets where the Batcave or the Hall of Justice had, rather inexplicably, their own jail cells. Also among a variety of funny one-off lines, Hush's "Dammit" was pretty close to the top. Another feather in Arkham's cap is that, at a time when surprises are all-too-rare in comics, the book totally got me in the revelation that Arkham's Border was actually the Joker, and that's even knowing that Endgame is coming. Between Border and Meeks, Arkham Manor does a lot for me to redeem Scott Snyder and company's Batman Vol. 6: The Graveyard Shift, which seemed very disconnected but actually subtly leads into Arkham Manor much more than I expected. Not to mention that, while Arkham Manor and Gotham Academy are tonally very different -- though somewhat similar in their individual enclosed world-building -- Arkham has a brief but important moment that will likely resonate in Gotham Academy later on. DG: I hadn't realized how tied into Batman: Eternal this book was! I don't see this as a problem, since Arkham Manor deliberately feels like a follow-up to that event. It's just that I haven't read Eternal yet, so to give it some sort of perspective I mentally placed it as the aftermath of another disaster story: No Man's Land. Looking back on it, this seems intentional on Gerry Duggan's part, since No Man's Land was the first story to have a Batcave under Arkham Asylum. It's an idea replicated in the Arkham video games and twisted here to put the the new Asylum on top of the original Batcave. It took only a bit of research to figure out some of the Eternal elements that I had missed, such as the situation with Hush and who Meek is. I liked that the new characters were mixed in with some of the classic villains, like Scarecrow and Amygdala (shooting straight past Kite-Man on the "obscure rogues available for this story" list). Mister Freeze in particular goes through some character development that I'd wanted to see from him for a while now. From his origin, Freeze could easily have become a hero instead of a villain, and he's at least at peace in his current situation. CE: Freeze's turn of conscience is pretty important in this story, being first persuaded to help defeat "Clownface" and then when he has a chance to escape, only going so far as to lay down in the snow in the yard. I think it's not a coincidence that just after the Freeze joins the side of angels (albeit with some persuasion), Batman sees the criminal he brutalized earlier and feels some regret for it. Though it will likely go unremarked upon elsewhere, that's a big moment in the Bat-universe, for Batman to think, "Y'know, I broke that guy's face and I probably shouldn't have," a notion I think most Bat-writers don't go for (and I found it doubly remarkable considering my initial impression of Duggan as a slapstick writer). It carries over to later in the book as Batman comes to see himself as also fighting for the Arkham inmates, not just against them, and also sees how Wayne Manor, once a sanctuary for him, can be a sanctuary for them, too. The series's final issue is pretty out-of-this-world, in that the main action doesn't take place in the Manor at all, but rather involves Batman capturing a mentally deranged inmate and then showing him consideration and mercy. In some respects Arkham Manor has potentially huge ramifications for Batman character-wise, but again I think the on-the-sidelines, quasi-miniseries status of this book will cause most of that to be left by the wayside. Which is a shame all around, not in the least because I'd like to see Duggan explain who the Spider is and why Dr. Arkham is lying to the police. DG: I felt that Shawn Crystal's art really added to the mood of Arkham Manor, especially since Mister Freeze looks a lot like the animated Egon Spengler in The Real Ghostbusters. He wouldn't be right for other superhero comics, but I'd really like to see him on a main Batman book in the future. CE: I also found Crystal's art refreshingly different, especially his jut-chinned Batman with stubble. We don't often see Batman's chin so far out his cowl, and I thought "bearded Batman" (which would be incongruous anywhere else but works quite right here) was a great indication of the Dark Knight's state of mind. Indeed Crystal has a cartoony bent to his work sometimes, but brings the horror at others -- see the climax of the second chapter, with a comedic "hurl" on one page just after an inmate is tortured with a drill on the page before. Not to mention Crystal's vampiric, snarl-toothed Batman when the Spider's jig is up in the end. There's also a bevy of good variant cover artists here (something that doesn't usually catch my eye), including Eric Canete's for the first chapter. A creative team could do worse than leaving the reader wanting more, and Arkham Manor certainly does that. This is a welcome surprise, amidst a general uptick in Batman Eternal's quality in my opinion. I'm glad for this chance to experience Gerry Duggan and Shawn Crystal's work, and I hope it's not too long before they visit the DC Universe again. Great discussion! 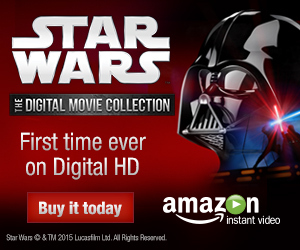 Really eager to check this out now. Duggan & Posehn are the first writers to make me love Deadpool -- their run has been packed with so much more nuance and heart than the usual immature humor that plagued so many prior iterations of the character. I highly recommend their entire run (including "The Gauntlet" and "Hawkeye vs. Deadpool"). I regret not giving Duggan and Posehn's Deadpool a shot due to my lack of interest in the character (not to mention his recent overexposure), because Duggan's runs on Hulk and Nova were stellar. Marvel was very smart to sign him to an exclusive contract, and I wish he were still available to take over one of the many DC books that are in desperate need of a good writer, like The Flash.